1) This paper is peer reviewed and presented at the 2014 FIG Congress in Kuala Lumpur, Malaysia. The paper discuss an RFID-based cadastral boundary mark system (RCMBS). The aim of the RCBMS is to modernize the conventional cadastral boundary marks with marks that are lighter, robust, and easy to locate, and which offer the capability to perform spatial/non-spatial cadastral information on site. The cadastral system in Malaysia needs to utilize appropriate technology such as innovation in Information & Communication Technology (ICT) to efficiently support a modern cadastral system and infrastructure. Ubiquitous positioning by integrating a multi-sensor and mobile database management system is an ICT innovation, which can provide benefits to the cadastral surveying community, such as aiding users in finding and/or updating information on the cadastral boundary mark on site. 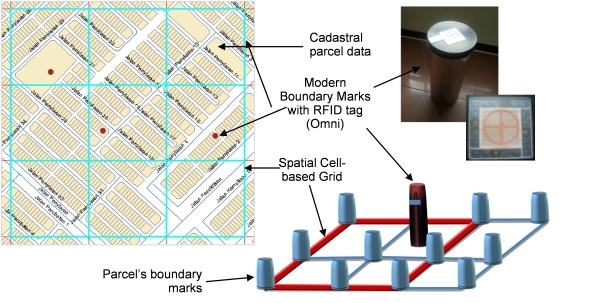 In this paper, an RFID-based cadastral boundary mark system (RCMBS) is discussed. The main aim of the RCBMS is to modernize the conventional cadastral boundary marks with marks that are lighter, robust, and easy to locate, and which offer the capability to perform spatial/non-spatial cadastral information on site. The RCMBS contains few subsystems and each component of the subsystem needs to be developed in order to execute the system. A prototype platform of the RCBMS has been produced to gather more information, demonstrate the functionality to help solidify requirements, and technically understand the problems of the system. It is expected that the RCBMS will provide a valuable support for cadastral practice in the country. The technical future of cadastre was explored in the 1990s and resulted in ‘Cadastre 2014’ – a blueprint of technical advancement which is a very useful guide to plan for future development of the land administration system. The vision of Cadastre 2014 is to present a comprehensive land recording system in order to replace the traditional institution of ‘Cadastre’ and ‘Land Registration’ (Kaufman & Steudler, 1998). The Malaysian government intends to implement Cadastre 2014 in its land registration system and cadastral data management. In Malaysia, there are two organizations that are responsible for managing and maintaining the cadastre system: (1) The Department of Survey and Mapping Malaysia (DSMM) – responsible for preparing, producing and managing the cadastral spatial information including the surveying and mapping of the cadastre parcels; and (2) The Land Office (LO) – responsible for managing cadastral attribute information. To move toward Cadastre 2014, the Malaysian government has introduced and implemented two systems; the land registration system called e-Tanah by the LO and e-Kadaster by the DSMM. These two systems are considered as stepping-stones toward the modernization of the cadastre system in Malaysia. In the case of e-Kadaster, all the six (6) statements of Cadastre 2014 have been explicitly executed (Hua, et al., 2012). The cadastral system in Malaysia needs to make use of appropriate technology such as innovation in ICT to efficiently support the modern cadastral system and infrastructure. Ubiquitous positioning by integrating a multi-sensor and mobile database management system is an ICT innovation, which can provide benefits to the cadastral surveying community, such as aiding users in finding and/or updating information on cadastral boundary marks on site. Tcha (2006) proposed the possibility to acquire cadastral information by wireless network utilizing Radio Frequency Identification (RFID), which can be installed in the boundary mark. However, superior Internet service and coverage must be ensured to capture the information for the application of this proposed approach. Musliman et al. (2012) use an approach of a low-cost ubiquitous positioning by integrating a multi-sensor and online database in a single system in order to locate and retrieve information of cadastral boundary marks on site, in real-time. Their research focuses on the Malaysia cadastral system with the possibility to apply a cadastral cell-based concept for the proposed system. In this paper, we extend the above work on the prototype of RFID-based cadastral boundary mark system, or simply RCMBS. This paper is organized into five sections. In Section 2, the concept of the RCBMS is highlighted. In Section 3, prototypes of the RFID-based boundary mark and the system applications are emphasized. Discussion on the needs for a pilot study and the possibility to test the RCBMS is provided in Section 4. Finally, Section 5 highlights the overall idea and concluding remarks. The main aim of the RCBMS is to modernize the conventional cadastral boundary mark with marks that are lighter, robust, and easy to locate, and which offer the capability to perform spatial/ non-spatial cadastral information on site. The RCBMS design matters for this study were conducted in order to achieve the following criteria: (a) ability to acquire spatial and attributes information of a cadastral boundary mark directly on site; (b) a low-cost system and minimized time to locate the cadastral boundary mark and retrieval of cadastral information; (c) ability to utilize the National Digital Cadastral Database (NDCDB), and (d) a single system to manage cadastral boundary mark information. 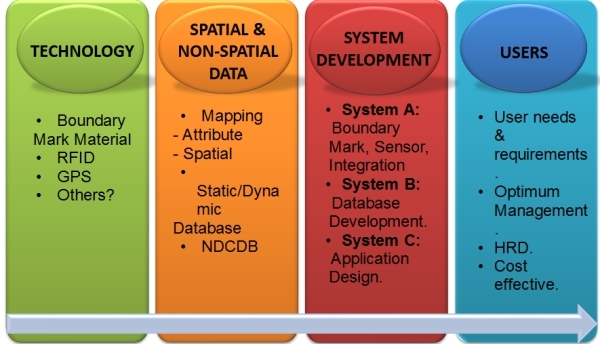 The common approach to achieve the above criteria therefore will consist of technology update, input of cadastral information, effort on system development and contribution from the potential user (see Figure 1). Figure 1: Common approach of the RCBMS. The RCBMS is adopted as a combination of Global Positioning System (GPS) and the RFID. Both technologies are straightforward in terms of application that is to effectively support the RCBMS user to navigate to the location of the boundary mark and to retrieve its cadastral information, respectively. The focus is also given on the materials used in making of the boundary marks where recyclable materials are preferred, and a technology in material engineering is applied to produce strong and durable boundary marks at low-cost. The DSMM has successfully developed the NDCDB for Peninsular Malaysia. This national database contains the digital cadastral information as the backbone for the e-Kadaster by DSMM which serves cadastral activities in the country. The NDCDB is to be utilized as the primary data source to facilitate the RCBMS. The challenge is therefore to synchronize this large database of NDCDB with the mobile database within the RCBMS. The development of RCBMS consists of Subsystem A – multi-sensors integration and design of the RFID-based boundary mark; Subsystem B – the key to success in the RCBMS is the cadastral boundary mark management system that deals with cell-based structure to optimize data query and retrieval from the mobile database; and Subsystem C – to design mobile applications of RCBMS within the RFID reader processing unit. Figure 2 illustrates these three subsystems within the RCBMS. Figure 2: Subsystem of the RCBMS. The final approach in the RCBMS is to attain the cooperation amongst the government agency, university and private sector. The government agencies, specifically the DSMM, work on the policies, requirements and guidelines to ensure best practice of the RCBMS amongst the private sector. The university is responsible for conducting research and providing training for the RCBMS, both for the government agencies and private sector. The private sector will benefit from the RCBMS in its cadastral activities, and will also provide valuable inputs to improve the system. This approach of combining the interests of the above three parties will ensure best practice and flexibility of the RCBMS. Musliman et al. (2012) have proposed a cell-based concept in order to manage the cadastral data for the RCBMS. The cell-based concept has been used in the telecommunication industry which is also referred to as the Global System for Mobile Communication (GSM). The GSM network is made up of geographic areas. As shown in Figure 3, these areas include cells, location areas (LAs), mobile services switching center (MSC) or visitor location register (VLR) service areas and public land mobile network (PLMN) areas. The cell is the area giving radio coverage by one base transceiver station. The GSM network identifies each cell via the cell global identity (CGI) number assigned to each cell. The location area is a group of cells which is the area in which the subscriber is paged. Each LA is served by one or more base station controllers, yet only a single MSC/VLR (refer Figure 4). Each LA is assigned with a location area identity (LAI) number. 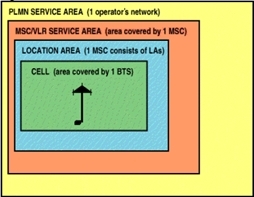 An MSC/VLR service area represents the part of the GSM network that is covered by one MSC and which is reachable, as it is registered in the VLR of the MSC (refer Figure 5). Figure 5: MSC/VLR Service Areas. Similarly, the spatial cell-based concept can be applied for the RCBMS with the RFID tagged marker being placed at spots acting as the MSC/VLR. It is determined that the shape of the cell is square, grid or hexagon (refer Figure 6). Jeong et al. (2011) have also utilized the same concept of applying the RFID technology in their prototype system of a 3D cadastre in Seoul, Republic of Korea. Figure 6: Grid type of spatial cell-based concept. In the RCBMS, a secondary database engine (MySQL) was used to support the server side tasks and scripting. 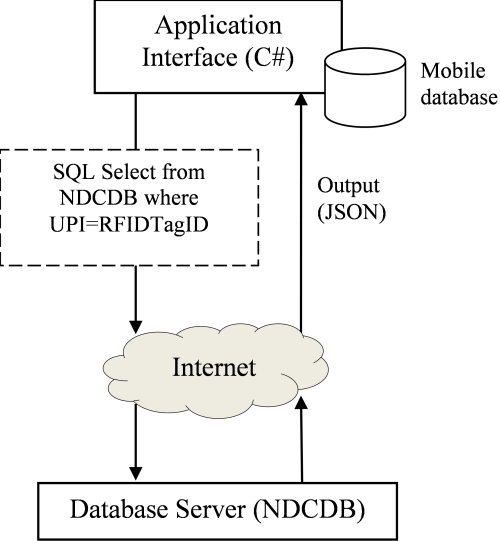 The MySQL database is used to store RFID tag information of boundary marks and its unique public identifier (UPI) key, which will virtually connect to the existing NDCDB. The user will send a request to the server via the application in C# environment. At the server side, each request will be processed to perform standard structured query language (SQL). The returned results are the information of an RFID-tagged cadastral lot with its associated boundary mark and attribute information. The concept of this application is shown in Figure 7. 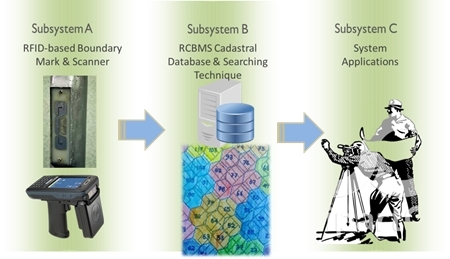 Figure 7: The concept of RCBMS mobile database and query system. A hypertext preprocessor (PHP) is used to perform the server side task. Once a user sends a request to the server, the SQL query will be executed and outputted as JSON data format (as shown in Figure 8). Figure 9 shows the SQL select function code written in PHP. Figure 8: Sample of PHP syntax for data query. 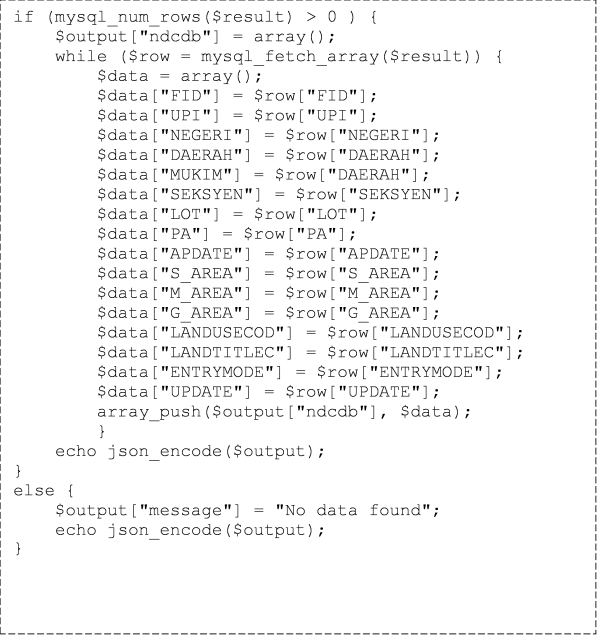 Figure 9: Sample of JSON syntax within PHP for output from database server. As indicated in Section 2, the RCMBS contains several subsystems and each component needs to be developed in order to execute the system. The idea is to develop a prototype platform which can gather more information, demonstrate the functionality to help solidify requirements and technically understand the problem of the system. In Prototype 1, the focus is in producing the cadastral boundary mark itself. For many years, the conventional cadastral boundary mark has been used in Malaysia. It is made from concrete in the form of a cylindrical shape with a dimension of 70 mm in diameter and 600 mm, with a weight of approximately 7 kg. This type of boundary mark to a certain extent is heavy to transport, brittle and does not carry any information on site. The main ingredients in Prototype 1 are chosen from recyclable materials to ensure low-cost production compared to the conventional concrete type boundary mark. 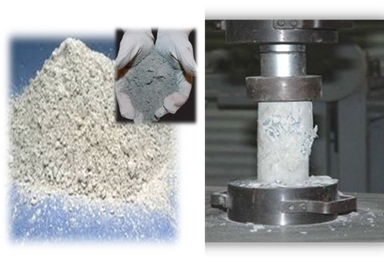 These recyclable materials consist of palm oil ash (POFA) and pulverized fuel ash (PFA) (see Figure 10; left). Figure 10: POFA and PFA (left) and compression test (right). Table 1: Compression test results on three samples of Prototype 1. The compression test was performed on the three samples of Prototype 1 (Figure 10; right) by the Civil Engineering Testing Unit (CETU), Universiti Teknologi Malaysia. The compression test indicates that all samples have almost similar results (see Table 1), although Sample B has shown better impact on crushing load and strength. This could be the reason of the weight of the specimen in Sample B which is slightly heavier than the other two samples. Several steps in producing the model of the RFID-based cadastral boundary mark are shown in Figure 11. While most steps can be undertaken in between 1 and 2 days, the curing process requires a longer period of time. In the case of concrete, the duration of curing depends on the grade and type of materials, mix proportion, desired strength, shape and size of the concrete member, and environmental and exposure conditions. The duration may vary from a few days to a month (Kulkarni & Pereira, 2011). 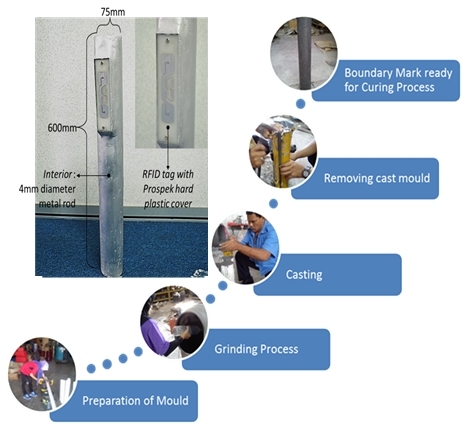 Experience in Prototype 1 has suggested that the curing process is between 7 and 28 days in order to develop strength and durability of the boundary mark. The final step in Prototype 1 is to equip the model with the RFID tag. A hard plastic cover was used to protect the chipped RFID tag and it allows a signal from the RFID reader to access the tag. The complete model of the RFID-based cadastral boundary mark with its standard dimension is also shown in Figure 11. Figure 11: Steps in producing the RFID-based Boundary Mark. The RCMBS consists of several applications to function as a complete system. In Prototype 2, these applications were developed within the RFID reader by using C# Microsoft Visual Studio programming language (Figure 12). 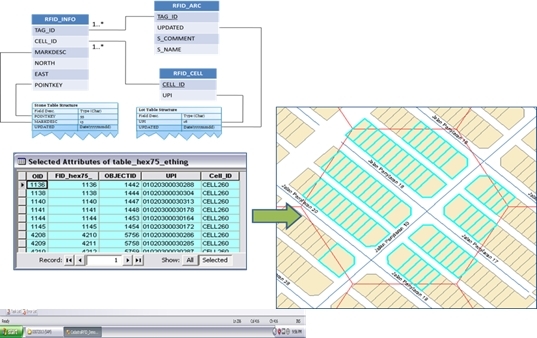 The source codes of two RCBMS applications for integration of spatial-attribute cadastral data and user RFID interface were coded in the RFID reader. Figure 12: The source code for RCBMS applications. In the case of the spatial-attribute data integration, the main task of the source code is to grab the cadastral attributes once the RFID reader is able to scan the tag ID of the RFID-based boundary mark (see also Section 2.3). These attributes were arranged in each individual data table that requires a fast data search engine through the database. Next, the source code will instruct the RFID reader to display these attributes and the spatial data accordingly. Figure 13 demonstrates this application as developed in Prototype 2 of the RCBMS. The source code for the user RFID interface is a command or menu through which a user communicates with the RCBMS via the RFID reader. The user interface in the RCBMS is a menu-driven interface in which a user can select command choices from various menus displayed on the screen of the RFID reader. The user only needs to scan the RFID tag of the boundary mark in order to activate various menus and to retrieve the cadastral information provided through the user interface. 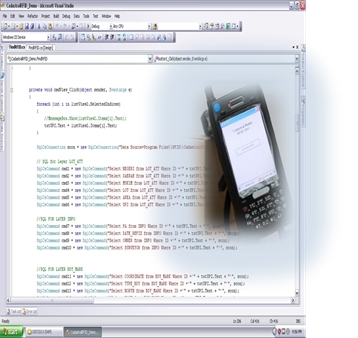 Figure 14 shows the user interface of the RCBMS which was developed in Prototype 2. Figure 13: Spatial-attribute data integration and retrieval. Figure 14: RCBMS user interface. There are a few aspects of the RCBMS that require further investigation. As aforementioned, the main aim of the RCBMS is to modernize the conventional cadastral boundary mark with marks that are lighter, robust and easy to locate, and which offer the capability to perform spatial/non-spatial cadastral information on site. In the next step of this study, a consideration is given to integrate the GPS sensor with the RCBMS. The GPS sensor may utilize the coordinates in the database to navigate the RCBMS user to the location of the boundary mark. However, the navigation solution as estimated by the GPS sensor may result in horizontal accuracy up to 17 m at 95% confidence level (NavCen, 2008). As the location of the current boundary mark is not necessarily with clear sky viewing conditions, this is a challenging task for the RCBMS. Next, it is suggested to improve the crushing load and strength of the cadastral boundary mark in Prototype 1 (see Table 1) in order to manage with the condition of the survey work. The possibility is to mix the recyclable materials with some amount of composite material such as coarse granular imbedded with cement. It is predicted that the strength of the materials will be increased but will be slightly heavier than Prototype 1. Subsequently, the focus must be given on the dimension of the spatial cell-based grid (see Section 2.2). The cell dimension is crucial to ensure the effectiveness in data retrieval from the RCBMS database. A possible solution is to classify the cadastral lots in that certain area, for example there are different numbers of cadastral lots in rural and urban areas. Another important issue in this study is to quantify the benefits of the RCBMS, and then compare these with the costs involved, i.e. cost-benefits analysis. In this way, the decision can be made to proceed or carry out several modifications in each prototype of the RCBMS. In addition, a small-scale experiment or pilot study could be highly beneficial during this cost-benefits analysis with a reasonable sample size of cadastral lots. This paper briefly summarizes the concept and initial prototype components of the RFID-based cadastral boundary mark system or RCMBS. The design approach of the system has taken into account the technology update, input of cadastral information, and the effort on system development and contribution from the potential RCBMS users. The concept of spatial cell-based grid is also explained to manage the cadastral data in the RCBMS. Moreover, the use of a mobile database is proposed for committing data changes or updates as seen in the field. The mobile database is also suitable for the RFID reader device that usually has storage and processing power limitation. In Prototype 1 of the RCBMS, the recyclable materials have been used as the main ingredients in producing the boundary mark. The compression test of Prototype 1 shows that the sample can deliver up to 13.9 kN and 3.6 N/mm on crushing load and strength, respectively. 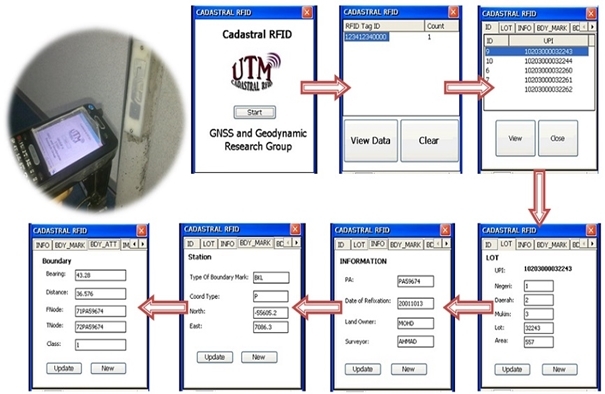 In Prototype 2, the source codes of two RCBMS applications for integration of spatial-attribute cadastral data and user RFID interface were coded in the RFID reader. The RCBMS is expected to speed up the time taken that is usually used to find and/or update the cadastral information on site. Moreover, the RCBMS can generate revenue from service fees where the user may be able to retrieve the online cadastral information. Hua, T. C., Lim, C. K. and Abdul Halim, N. Z. (2012) Menanda Aras Kemajuan Sistem Ukur Kadaster Berasaskan Kadaster 2014 - Persediaan JUPEM ke arah menjayakan Kadaster 2.0. Persidangan Pengarah-pengarah Ukur 2012, access via http://www.jupem.gov.my/. Jeong, D.H., Kim, T.J., Nam, D.H., Li, H.S. and Cho, H.K. (2011) A Review of 3D Cadastre Pilot Project and the Policy of 3D NSDI in the Republic of Korea. The 2nd International Workshop on 3D Cadastres, 16th-18th November 2011, Delft, the Netherlands. Kaufmann, J. and Steudler, D. (1998) Cadastre 2014 – A Vision for a Future Cadastral System. Working Group 01, Commission 7, International Federation of Surveyors (FIG). Kulkarni, S. B. and Pereira, C. (2011) Significance of Curing of Concrete for Durability of Structures. NBM Construction Information Portal, access via http://www.nbmcw.com/. Musliman, I. A., Musa, T. A. and Omar, K. (2012) Integration of Multi-Sensor for Modern Cadastral Boundary Mark: First Experience. Buletin Geospatial, MaCGDI, Edisi 2/2012, pp. 6-11. NavCen, (2008) Global Positioning System Standard Positioning Service Performance Standard. 4th Ed. US Department of Defense: Position, Navigation, and Timing Executive Committee. Washington, DC. Tcha, D. (2006) A Study on the U-Cadastral Space Data Modeling in Korea. XXIII International Federation of Surveyors (FIG) Congress, Munich, Germany, Oct 8-13.